In an announcement released on Wednesday, January 20th, Both NASA and NOAA (National Oceanic and Atmospheric Administration) reported that 2015 was the warmest year since global temperatures were first recorded. During the same week last January, the same message was reported for 2014. These two US based agencies report that globally the high temperatures were fueled by record El Niño and its affect on climate change. In 2015, the month of December became the first month ever to increase 2 degrees F. In most of North America, December was more like March or April. Despite this global information, the hottest year on record did not apply to Canada. According to Environment Canada, Atlantic Canada was one of the only regions on the planet that had cooler-than average temperatures last year. Canada only experienced the 11th warmest year on record in 2015. On 12/12/2014 Project Watershed invited their regular volunteers, and some other friends, to an appreciation event at the Comox Valley Community Justice Centre in downtown Courtenay. With more than 50 attendees, including some of the local city council members who openly support Project Watershed’s work, enjoying local snacks and refreshments, the event highlighted the interconnected nature of the organisation’s work. In this video some top volunteers are acknowledged individually by Project Watershed chair Paul Horgen and Acting Estuary Coordinator Jennifer Sutherst. Project Watershed is inviting you to join us in inspiring the Comox Valley to experience the estuary by submitting a piece of your work in our 6th annual Keeping it Living Art competition and silent auction. Keeping it Living is an art and literature awareness and fundraising campaign to give everyone the opportunity to contribute to the preservation and restoration of the K’ómoks Estuary. The year’s title “Then, Now and Future” is to inspire the artist to capture their version of the past, present and future of the estuary…or all three! And as in every year the theme encompasses “all things estuary”, and is wide open to the whole ecosystem which extends into the Georgia Strait. 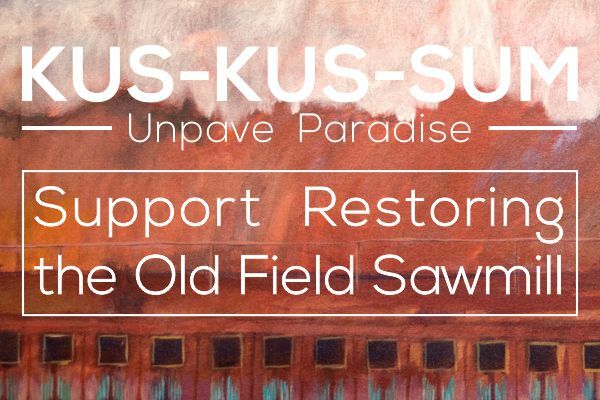 Nationally renowned First Nations artist Andy Everson will be creating a unique image for this years’ campaign. Join Andy in the creation of art inspired by our one of kind estuary. All types of art including (but not limited to) painting, sculpture, jewelry, pottery, photography and glass are encouraged. Artwork image submitted online as JPEG using the form found at www.keepingitliving.ca or by clicking here. With an election coming in a few days, all of the candidates running in Courtenay are firming up their platforms. 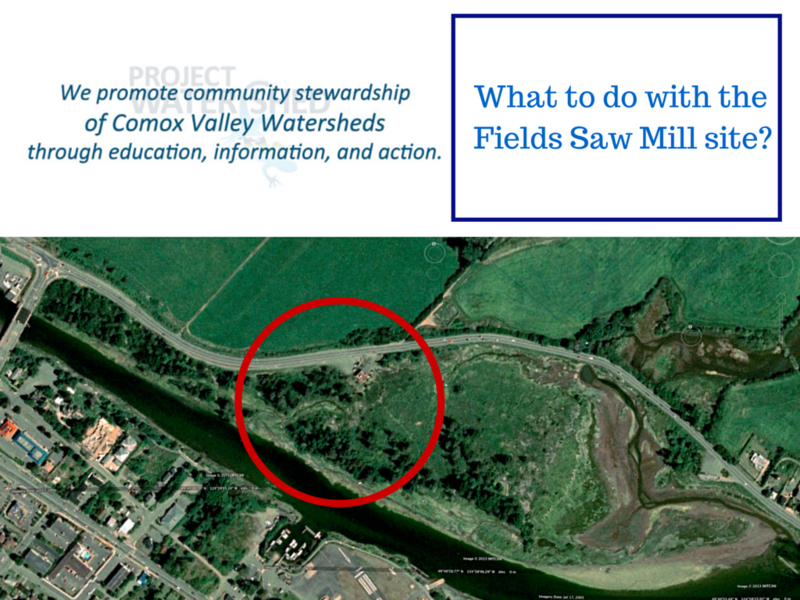 One of the important issues facing our beautiful community and is on the minds of not only citizens of Courtenay, but all of us who have chosen the Comox Valley as our home, is the old Field Saw Mill site. In November of last year, Project Watershed presented some preliminary ideas about the site and published them in local papers. They included feasibility of restoration. We have recently submitted our most current thoughts in another article submitted to local papers in the first week in November. The Project Watershed Board of Directors believes that this should be an issue discussed during the fall campaign. Consequently during the first week in October, Project Watershed invited or attempted to invite all of the candidates running to meet and discuss the issue. To date we have had replies /or and met with Jon Ambler (mayoral candidate) and Council candidates Doug Hillian, Bob Wells, David Frisch, Bill Anglin, Starr Winchester, Rebecca Lennox, George Knox, Eric Erickson, Stu MacInnis and Marcus Felgenhauer. All agreed that this issue should be put on the table for consideration. What a great start! We look forward to involving the entire Comox Valley in discussions related to restoring this site. What a legacy it would be for future generations. A tidal marsh is a type of marsh that is found along the shoreline of coasts and estuaries of which the flooding characteristics are determined by the tidal movement of the adjacent estuary. The vegetation on the shore is called a salt marsh and it is a complex of many salt tolerant plants. The vegetation from the tide line out into the waters of the estuary is composed of a single flowering plant known as eelgrass. Volunteers including three local candidates running for office in November have been working on the shoreline by the new Royston Seaside trail creating salt marsh benches. This new park site, in the early part of the 20th century, was an area with extensive tidal marshes. As the first settlers began to log forests in the area rails ran along the shoreline on an artificial dyke and logs were transported and dumped into the estuary for movement to saw mills. This activity went on for decades and caused major habitat damage to the estuarine ecosystems. The sunken ships that can be seen off the estuary shore are known as the ‘Royston Wrecks’. For years, these ships served to protect the shoreline against storm action and the scouring of the shore with logs in the water. “All of the damaging industry is in our past, but now is the time to work together and restore habitat. The amazing success so far is really encouraging”, commented Bob Wells, candidate for Courtenay Council. 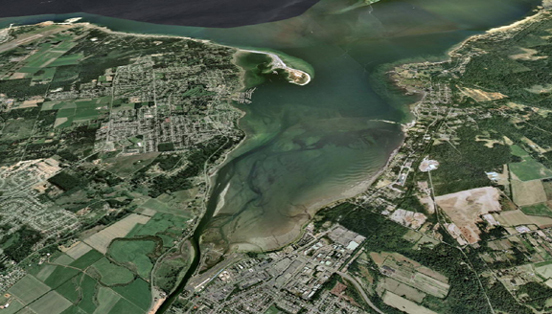 The Comox Valley Project Watershed Society has embarked on a major restoration project to re-establish the tidal marsh system lost during that time. All of this is occurring along this new CVRD trail which will become a major destination in the Comox Valley for residents and tourists wanting seaside outdoor activity. 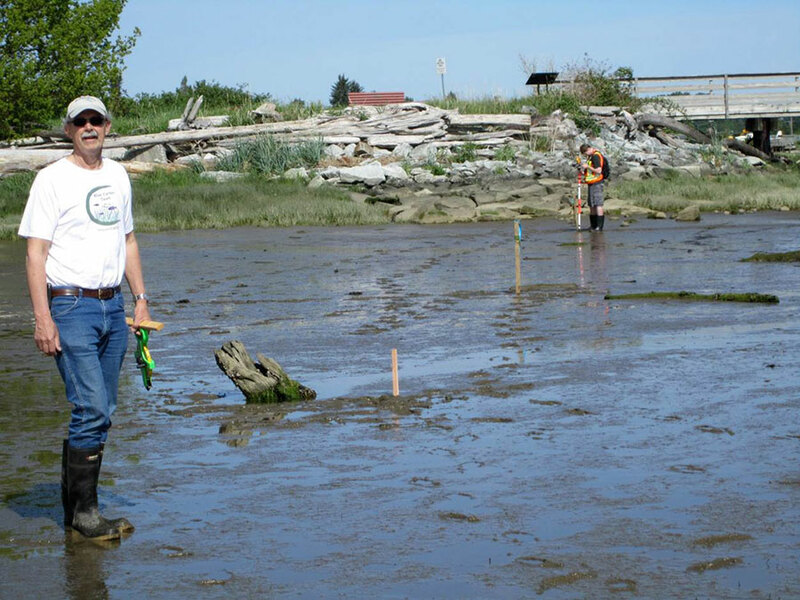 “I was very encouraged with the enthusiasm of the staff and volunteers of Project Watershed for this tidal marsh restoration effort ,” stated Rebecca Lennox, candidate for Courtenay Council. “We have restored almost 2000 m2 of eelgrass in the intertidal and sub tidal waters near the Wrecks and have just started the construction of three salt marsh benches which will occur over the next six months” reports Paul Horgen Chair of the Board. Photo by Jennifer Sutherst – Rebecca Lennox and Technical Director Dan Bowen discussing the planing of salt tolerant species on the newly formed Royston salt marsh benches. Trust you all had a relaxing and enjoyable summer and are keen to get out and enjoy some great fall days in our valley’s superb natural environment. The Great Canadian Shoreline Cleanup will be running for a week (Sept 20 to 28) so it will give you a moral reason to be out helping to clean up your local streams and waterways. If you want to participate in an organized cleanup the CV Nature group will be picking up litter at the Airpark on Sunday, Sept 21st and I have registered the Simms Park area on behalf of Project Watershed to be groomed on Sunday, September 28th (also BC Rivers Day). Both cleanup parties will be meeting at their respective parking lots and run from 10 AM until noon . Bring gloves and a garbage bag (also family and friends) and wear appropriate footwear. Refreshments will be served during a tally-up of debris at the end. Hope to see you out there – working to better our natural environment is always a feel-good and very worthwhile activity. Something interesting is happening in our local waters. 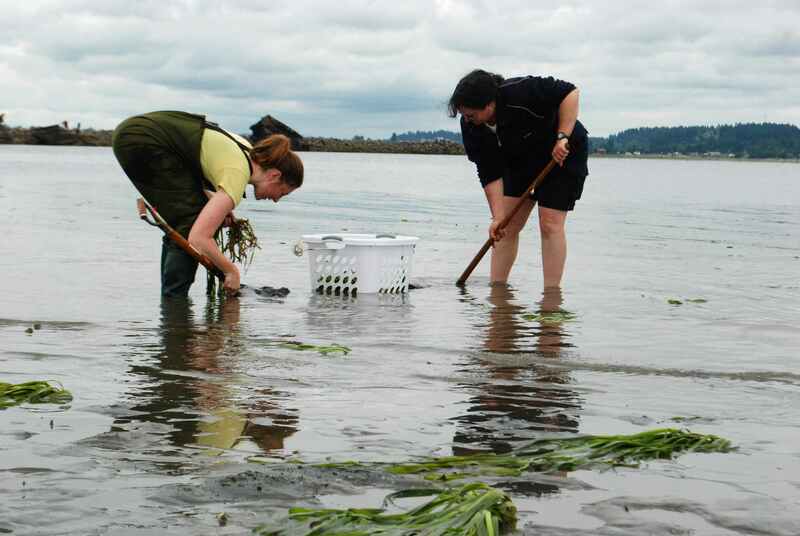 Project Watershed, a local environmental stewardship organization, is working on a project to learn more about how salt marsh and eelgrass beds in our local Estuary contribute to the uptake and storage of carbon from the atmosphere, called Blue Carbon. Better understanding is required to determine the economic value of estuarine habitat restoration in terms of the amount of carbon dioxide removed from the atmosphere and stored. Any mechanism that reduces the amount of carbon dioxide in the atmosphere could help offset human-caused carbon emissions. In the K’omoks Estuary, both salt marsh and eelgrass beds capture carbon dioxide from the atmosphere through photosynthesis and store it in the underlying sediments. These estuarine habitats are widely recognized as important habitat for marine creatures and for foreshore resilience. However, before they can be valued additionally for the carbon they store, fundamental research is required to link the two. This activity is being pursued by Project Watershed with funding provided by the Commission for Environmental Cooperation (CEC) – The Commission for Environmental Cooperation (CEC) is an intergovernmental organization that supports the cooperative environmental agenda of Canada, Mexico and the United States to green North America’s economy, address climate change by promoting a low-carbon economy, and protect its environment and the health of its citizens. Project Watershed is one of just three organizations in all of Canada that received funding. The goals of the project are to develop a protocol suitable for other community groups to assess carbon stores and rate of carbon sequestration in estuarine habitats. In addition, Project Watershed aims to foster greater community involvement and understanding of the environmental and economic benefits of eelgrass and salt marsh restoration. The fieldwork for this project commenced in May of this year and will continue through the summer of 2015. 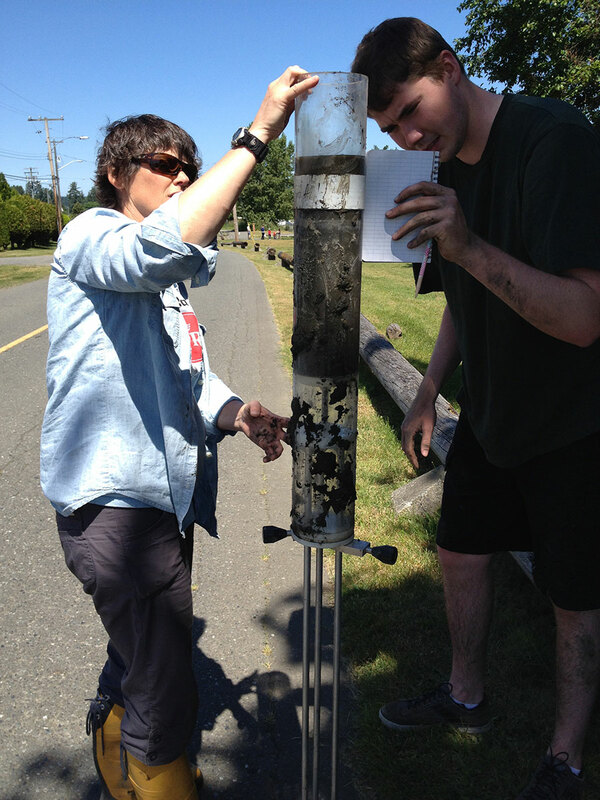 Sediment cores will be collected and assessed for the amount of carbon in the different layers beneath the surface. This information can be used to determine the rate at which carbon is accumulated and stored over time. Comparisons are being made between sites with eelgrass or salt marsh vegetation and sites void of vegetation to determine if the sediments below vegetated sites store more carbon. This type of work relies heavily on community involvement. If you are interested in getting involved, please contact Paul Horgen, Head of the Blue Carbon Team (p.horgen@utoronto.ca) or phone Project Watershed at (250-703-2871). I have had a busy and exciting first month with Project Watershed. In the first couple weeks I assisted with eelgrass bed restoration. My duties included the maintenance and operation of a small boat, preparing eel-grass for planting and shuttling divers to planting sites. I also helped to survey inter-tidal sites that will later be restored using a GPS. After that I began to help with the collection of sediments that will be analyzed for their carbon content. I worked off the “Chetleo” from VIU to collect sub-tidal samples and also collected sediment cores in inter-tidal areas. I have also been creating field equipment, such as quadrats and a plumb line, that will be used for our field work in the coming weeks. A letter of federal recognition was given to the Comox Valley Project Watershed Society on the Blue Carbon Pilot Project from federal Environment Minister Leona Aglukkaq. “Your organization’s contribution is an essential part of the environmental agenda. 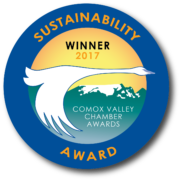 I wish the Comox Valley Project Watershed Society every success in carrying out this important initiative for a healthy environment,” writes the minister. In March, the Blue Carbon Pilot Project received $230,000 through the North American Partnership for Environmental Community Action (NAPECA) grant program of the Commission for Environmental Cooperation (CEC). They also accepted a $10,000 grant from the Pacific Institute of Climate Solutions to hire a student summer intern from a university — a first for the Blue Carbon Pilot Project. Paul Horgen, chair of the board of the Comox Valley Project Watershed Society, is pleased with the minister’s recognition of the initiative, and hopes that both local and federal politicians will give ear to the cause. “I want to encourage politicians who don’t think about it to think about it,” Horgen says. The Blue Carbon Pilot Project’s overall objective is to reduce the amounts of carbon dioxide damage in the environment, which is predicted to reduce climate change. The main goals include growing the estuarine habitat, restoring shorelines, and fostering a community understanding and action about the issue. In total, British Columbia has 27, 200 kilometres of shoreline and 422 estuaries. Coastal vegetation such as marshes and seagrasses are incredibly efficient at absorbing and storing the carbon dioxide. The carbon stored within these aquatic environments is known as blue carbon. 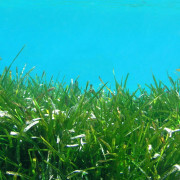 Eelgrass, also known as Zostera marina, is one of the seagrasses that is able to hold the carbon. The education, preservation and expansion of eelgrass growth is a key component to the success of the project. One of the next steps for the Blue Carbon Pilot Project is to figure out how to measure the carbon in these aquatic environments. “We need to measure what’s in the current sediments now, and take samples from a non-eelgrass location and an eelgrass location to measure the carbon,” Horgen says. In the meantime, the Comox Valley Project Watershed Society is waiting to hear back from other grant applications. Horgen says that once the amount of funding is known, then they can move forward in searching for the proper amount of volunteers and workers needed. “That’s one of the things I think is often not really well understood, is that stewardship groups bring volunteers and tourists in, and are providing economic input to the Comox Valley,” Horgen adds. 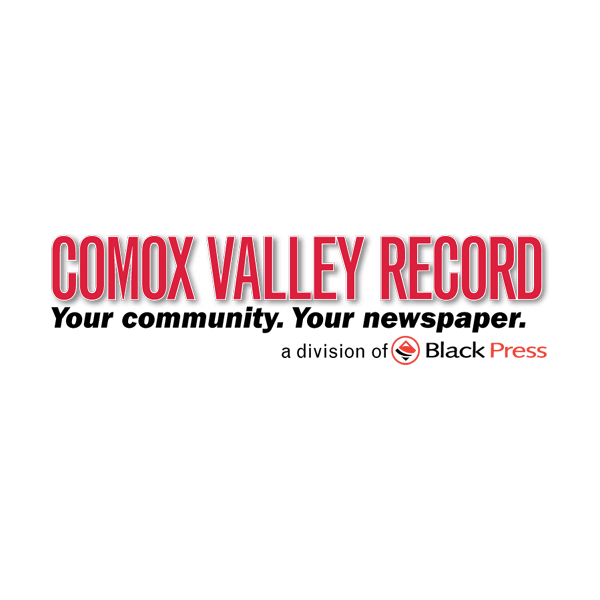 Read this article on the Comox Valley Record website. Read this article on Paul Horgen’s website.